Guernsey was liberated on 9th May 1945, and this year one of my poems Root and Branch was beautifully read as part of a Liberation Day sermon by Dr Jonathan Frost, Bishop of Southampton. The service was featured on BBC Guernsey and you can listen here. The service starts at around 1:31 and my poem Root and Branch read at 1.52. Obviously actually being part of the sermon made me feel incredibly proud, not to mention slightly amazed as I knew nothing about it beforehand. The poem is my attempt to put myself in the position of a mother whose children have been evacuated to England. This agonising decision was faced by many in the islands. My Grandfather David Marquis was on the island throughout the occupation, but his mother decided to evacuate many of his brothers and sisters. This necessity sundered island families and created all kinds of mixed feelings. 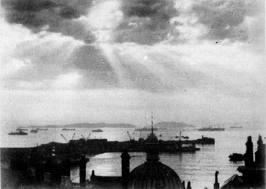 After the war, for example, many evacuee children returned to the island as strangers to Guernsey and to their natural families. For me, being in a place that was occupied made living on Guernsey rather different to being in England. Having started school in St Martins there seemed nothing strange about having a German bunker in the playground for example, or that my Grandfather should have a smattering of German, and a dagger looted from the Nazis. Even today the coast still bristles with various Nazi fortifications. Hitler’s idea was to turn the northern coast of Europe into a ‘ring of steel’, and as Guernsey is located in a place of such strategic significance its defences were formidable. This explains why liberating the islands happened after the collapse of the Nazi war effort. Taking back the islands by force would have resulted in all kinds of bloodshed. By 1944 the food situation was alarming on the island. I have a copy of The Star dated Tuesday May 2 1944, ostensibly a Guernsey newspaper but filled with vile Nazi propaganda. 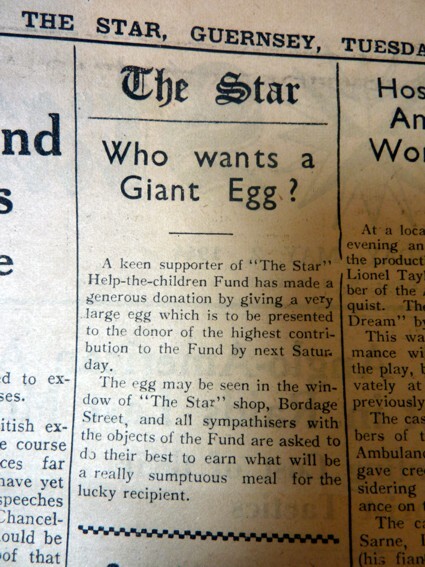 It does contain an illuminating local news item about the auctioning of a large egg for charity, which concludes ‘all sympathisers with the objects of the fund are asked to do their best to earn what will be a really sumptuous meal for the lucky recipient’. They are calling a large egg a sumptuous meal. After the D-day invasions of June 1944 the allied forces pushed slowly into France, which meant the German supply lines to the islands were strained and eventually cut off completely. The islanders of course had already been hungry a good deal of the time, but now that even the Germans supplies were sundered, it was to be a long hard year of near starvation for many before liberation eventually arrived. Here is the text of my poem. Other of my poems about the island are available in A Guernsey Double, written with my friend Richard Fleming, and featured in the side bar of this blog. they will break us at the table. and trill their songs with English tongues. I dropped them from my stupid limbs. This entry was posted in Guernsey and tagged Dr Jonathan Frost, Guernsey, Liberation Day, Root and Branch, The Star. Bookmark the permalink. Congratulations, Peter, on being such an important part of the Liberation celebrations. I cherish the picture I have of my uncle David who died, aged ten, whilst an evacuee in Lancashire. Wonderful poetry.